Combining turning, milling and grinding operations in a single machine tool has generated considerable interest in SORALUCE’s VTC range of large vertical turning centres. Demand for these versatile and extremely rigid machine tools is across the complete spectrum of manufacturing industry, from power generation and transport to mining and oil & gas. This is because the modular design enables a wide variety of different configurations to be produced quickly, efficiently and cost-effectively. The VTC-2500 on display has a table diameter of 2100 mm and is capable of turning a 2500 mm diameter on a workpiece weighing up to 20,000 kg and rotating at speeds up to 260 rev/min. The VTC-2500 ram’s X axis traverse is 2870 mm and its Z axis stroke is 1500 mm. This machine has its table supported radially and axially on hydrostatic bearings. The machine offers excellent results in accuracy and finishing. The VTC machines are extremely rigid. The main elements of the machine such as base, columns and cross rail are ribbed castings providing a high degree of stability to the machine assembly. They are fully stress relieved prior to final machining to enable the machine’s structure to absorb the stresses and dampen the vibrations induced by cutting forces even under the heaviest cutting conditions. The RAM is made from a normalised steel forging, induction hardened and precision ground. VTC range can be completed with a wide range of turning, drilling, milling grinding and threading heads available, each fitted with an integral bearing. 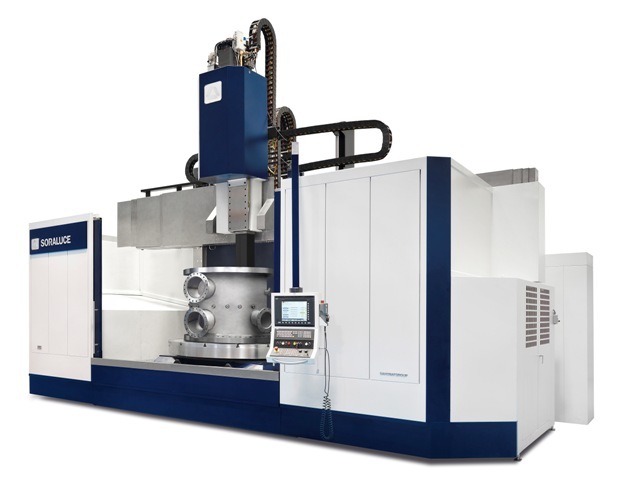 The exhibited machine is equipped two turning tool holders and one straight and one 90º milling heads for live tools. Additionally it is fitted with an automatic tool changer ready for 18 tools.